Last week we organised XP Days Benelux and I’ve just about recovered from it. It was fun, as usual, and participants seemed generally happy with the event. You can see for yourself in the reports, participant retrospective and session feedback. There are also a lot of things which could be better. The organisers are already busy setting up a retrospective and next year’s events. If you’ve written about XP Days Benelux, let us know. We gather all the reports on the conference website. If you have any feedback or ideas for improvement, let us know. Even better, join the organising committee and realise your ideas. Organising a conference is fun even if you’ve never done it before. There are enough experienced organisers to pair with. It does take some time and effort, so make sure that you’ll be able to invest in the conference. In return, you get the chance to take part in a non-IT Agile project. 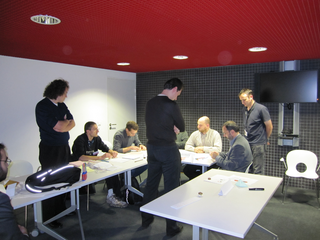 This year, I participated in two stops of the Agile Tour in France: Besançon and Lille. In Besançon I presented the “Résoudre les Conflits sans Compromis“. In Lille I presented the “A l’aide! Mon processus m’étrangle“. The participants of the Conflict Resolution in Besançon did a session retrospective. Both conferences were relatively small (fewer than 100 participants) with three tracks, so that it was possible to meet many of the participants and the audience sizes weren’t too large. Participants to both workshops happily played along and told me they had learned some useful techniques. Going to lunch and dinner with local agilistas and hearing about their challenges and successes. I’ll be back soon in Besançon. I hope I’ll be back soon in Lille, and this time not just as a train stop between London and Brussels. Participating in Christophe Thibaut’s well-rehearsed and interactive Haskell kata and going off the cliff with him as we “implemented just one more small feature” because we took too big a step and failed to really let the tests drive the code. Participating in Olivier Albiez and André Dhondt’s Pomodoro simulation. 15 participants for the Conflict Resolution session. 8 participants for the Theory of Constraints session is just enough to run the simulation. Not being able to talk with all the participants I wanted to talk with. Only 8 participants for the Bottleneck session. Forgot to bring Belgian Chocolate to Besançon, so got lots of “What Went Wrong” feedback. My eyes hurt during the Haskell kata session in Lille, probably because of the lighting in the low-ceilinged meeting room. What’s the real state of agility in France? It seems that there’s less uptake than in the “Anglo-Saxon-oriented” countries (UK, the Flemish part of Belgium, Netherlands, Scandinavia, Finland). Why? Is the language a factor? Where are the French-speaking Belgian Agilists hiding? I know only three, but there must be more. It’s not an Agile Coach session if it doesn’t contain chocolates and sweets. The “Resolve Conflicts without Compromise” session works in French too. That means I’ll have to translate the materials in French. Merci aux organisateurs, orateurs et participants. Et, qui sait, à l’année prochaine?